I was worried that we would wake up to snow and then get rain later in the day, but luckily, there was no snow—and it showered a couple of times during the day when I was at work, so I didn’t end up wishing I wore my Hunter boots. Phew! I realized that this is my favorite way to wear this dress: as a duster instead of a dress. It worked well over this striped tee and blended well with the dark denim, but I wonder if I would prefer it with a navy striped tee and white denim? I may have to try that this spring! Another day at work! This outfit is basically my winter uniform: cozy sweater, skinny jeans/pants, and boots (though I tend to wear ankle boots more often). It’s easy, comfortable, and feels like me. I love this ivory, olive, and black color combination; it’s simple but feels luxe. I saved one of my least favorite outfits for last. 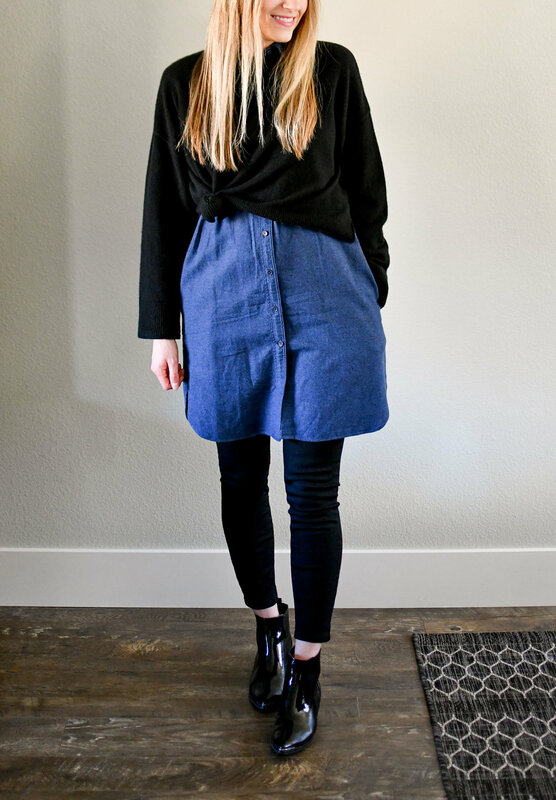 I wasn’t super in love with all of the layers; the jeans felt bulky under the dress, which tended to get caught on the jeans, and while I liked the idea of the sweater layered over the dress, I wasn’t a huge fan of either letting it hang naturally or tying it at the waist like I did here. The sweater wasn’t quite cropped enough to look right by itself over the dress. Oh well! I appreciate doing style challenges like this because it forces me to try new things and I figure out what I really like to wear.